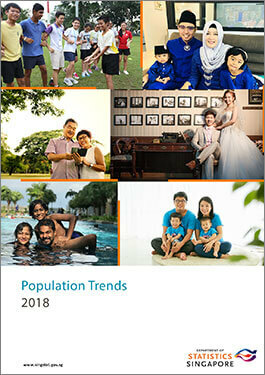 Population Trends, 2018 provides a statistical analysis of Singapore’s changing population profile. It is the fourteenth edition of an annual series that consolidates different aspects of demographic statistics in a single volume. The report comprises five sections, namely, ‘Population’, ‘Households and Housing’, ‘Family Formation and Dissolution’, ‘Fertility’ and ‘Mortality’.